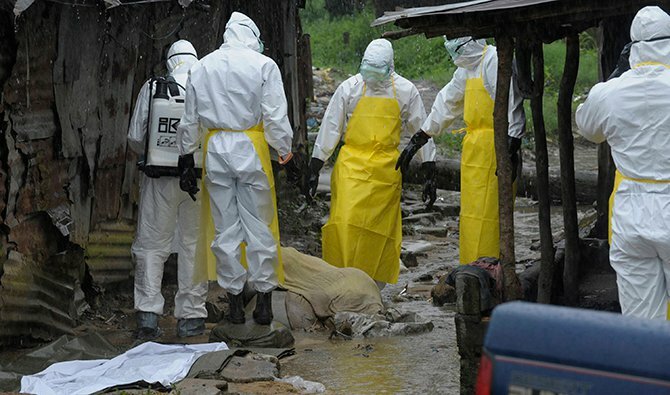 BBC Online: Health workers wearing protective clothing prepare to carry an abandoned dead body presenting with Ebola symptoms at Duwala market in Monrovia. Liberia has imposed a night-time curfew and has quarantined an area of the capital Monrovia in a bid to halt the deadly Ebola outbreak. President Ellen Johnson Sirleaf said the curfew would be from 21:00 local time to 06:00 (21:00-06:00 GMT). She said all movement would be blocked in and out of the West Point area. Meanwhile, three doctors with Ebola who started taking an experimental drug last week showed remarkable signs of improvement, a Liberian minister said. Information Minister Lewis Brown said the drug was given to one Nigerian and two Liberian doctors who had caught Ebola while helping to save the lives of other victims of the virus. In a radio broadcast, Sirleaf blamed her government’s failure to bring Ebola under control on the public’s disregard for the advice of health workers and disrespect for official warnings. Liberia already imposed a state of emergency earlier this month, but the number of deaths from the disease has continued to climb. A mob attacked a health centre in West Point on Saturday, during which 17 suspected Ebola patients went missing.